In areas where brain tissue was introduced (thickening of the green signal), the damaged cells divided even more frequently. Cancer cells divide with more frequency and are more resilient when they are closer to the brain, indicating a potential link between cell growth and the nervous system, according to new research from Professor Néstor J. Oviedo of the University of California, Merced. The study, published today (May 17) in the prestigious journal Development, could have significant implications for our understanding of cancer and how to treat it. Oviedo’s study was designed to investigate why cells in the upper and lower halves of an animal’s body behave differently. Research has shown that cancer cells transplanted to the upper half of a body will grow more aggressively than in the posterior region of the body. In humans, the survival rate for skin cancer patients is lower when tumors are closer to the head and neck. To better understand this phenomenon, Oviedo turned to his favorite invertebrate, the planarian. Oviedo has previously used the flatworm, which can quickly regenerate parts of its body and whose stem cells are similar to those found in humans, to learn more about cell growth and death. 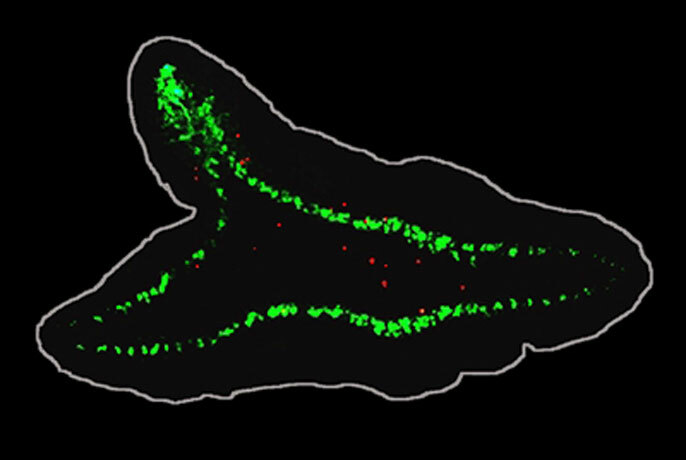 Damaged cells (illuminated) died off in the lower half of the planarian, but persisted in the upper half. One of the first signs and causes of cancer is DNA damage in cells, so Oviedo first generates DNA damage to all cells in the adult planarian body. In the planaria’s posterior half, most of the damaged cells died off. But in the anterior region, fewer cells died — and, surprisingly, the damaged cells were able to divide and even over-proliferate, a hallmark of cancer cells. This finding could have great significance in understanding how cancer initiates and the mechanisms that allow damaged cells to avoid cell death. Further, Oviedo found that introducing brain tissue into another part of the planarian body led the damaged cells to resist dying. Rather, they proliferated in greater numbers in that area, suggesting brain tissue may alter the fate of cells with damaged DNA. “Given what we found, it’s likely that signals from the nervous system are mediating in the process that allows cells with DNA damage to evade or resist tumor suppressors and continue dividing,” Oviedo said. The study was led by Oviedo — who is affiliated with the university’s School of Natural Sciences, Health Sciences Research Institute, and Quantitative and Systems Biology graduate group —with help from UC Merced graduate students T. Harshani Peiris, Daniel Ramirez, Paul G. Barghouth, Udokanma Ofoha, Devon Davidian and Frank Weckerle.